Secondary education is the stage of education following primary education. Except in countries where only primary or basic education is compulsory, secondary education includes the final stage of compulsory education and in many countries it is entirely compulsory. Secondary education is characterised by transition from primary education to tertiary, post - secondary or higher education. 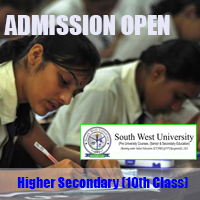 Higher Secondary Examination is a centralised examination of class 12. All the educational boards being autonomous bodies, their sessions of conducting exams differ from each other.